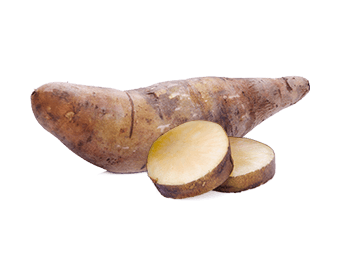 Yacon Root (Smallanthus sonchifolius) has an exotic flavor that has been described as a blend of sweet apples and watermelon. Considered to be the richest available source of fructooligosaccharides (FOS) which also include inulin, Yacon is a type of sugar that is not absorbed by the body but feeds the friendly bacteria in the digestive system, including lactobacillus and bifidobacteria. These friendly bacteria are essential for maintaining good health, as they offer protection from toxic bacteria. Since FOS is not digested by the body, these sugars do not raise blood glucose levels.